Bo's back in town. And one woman can feel it down to her toes. Dark Destiny is Bo and Lyric's story. 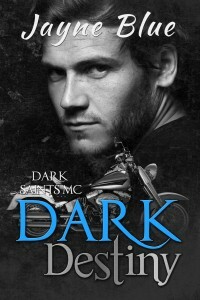 Bo Parker has been in the shadows, the periphery, the background of The Dark Saints MC. With Dark Destiny, we find out about the sacrifice he made for the club and for the love of his life. Lyric Wilde, his true love, showed up in Dark Instinct, pretty much out of nowhere. There she was in Port Azreal just waiting to find love and to tell her story. This Dark Saint novel really bloomed on its own. As authors, it was more about revealing what happened to them, finding things out we didn't know, rather than writing a book this time. Amazing experience! Bo and Lyric have an incredibly tough path to their true love. But when they get there you'll smile! And don't miss Hugo. This surprise character was a gem to write and reveals the tender heart that beats underneath all those muscles and leather! Enjoy Dark Destiny and if you'd like to see the very first-time Lyric appeared in the Dark Saints world be sure to read Dark Instinct, our take on Beauty and the Beast. And you better get to reading! Dark Oath, Deacon's story, is set to drop in March! Oh, Deacon, he's going to break your heart! ← Dark Saints Trailer and Release Date!